Beep, beep! Baby on board but not just that, this time baby is driving the bus. (Uh oh!) But not to worry: these electric cars are built for little ones to be able to take the wheel. Ride-along cars help children develop motor skills, hand-eye coordination, responsibility, and reflexes. And they’re also just plain fun. Kids love mimicking mom and dad, and driving is one of the grown up activities they most look forward to. These ten electric vehicles are some of the best “first cars” you can gift to a child. They’re all lauded as the most durable, safest, and kid-approved models on the market. Buckle up! The Born Cute research team has recently revised this buyers’ guide to reflect the most popular and high quality products at this time. We hope you and your loved ones enjoy your time “on the road” together! The Peg Perego Tractor still holds the number one spot however two new products round out the Top 3 list. All product information, including product specifications, price, ratings and availability, were checked and verified as accurate and up to date. 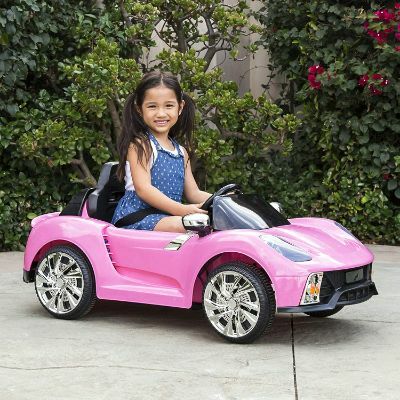 Don’t think that kids electric cars are only for boys; girls too, can have their very own wheels to drive. 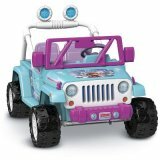 This ride on car for girls’ Jeep Wrangler is one cute and lovable yet tough looking electric car for kids to drive. It has all the different designs from the movie Frozen emblazoned all over its body painted in light blue with purple bumpers and windshield frame. The doors open to cute light purple seats with the crossbar of the rollover bar forming additional support for the kids’ backs. 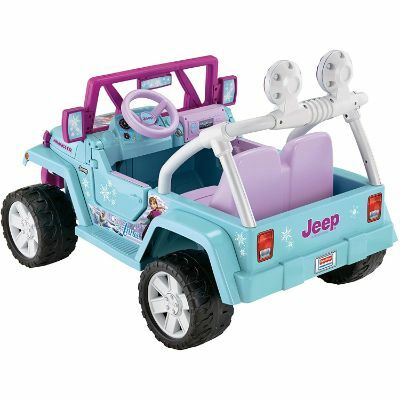 Towards the back of the Jeep is a spacious cargo bay for additional storage space; perfect for storing your little princess’ gadgets and essentials. The Jeep conveniently seats 2 little princesses for a combined weight of 130 pounds. This 12 volt ride on cars main benefit is a rechargeable battery that powers the Jeep Wrangler’s drivetrain to a maximum of 5 miles per hour. Now, if it is a younger princess behind the wheel, Mom and Dad can simply lock-out the high speed setting so it cruises at a safer speed of 2.5 miles per hour. 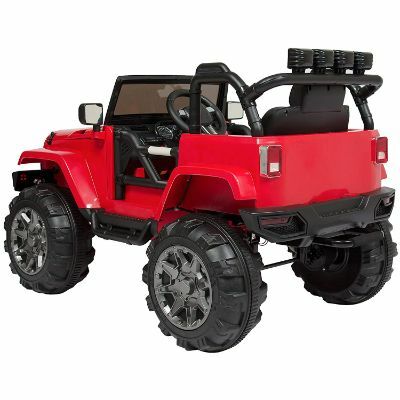 It’s got wide ATV like tires spread across a wide wheelbase with an excellent ground clearance. The tread of the tires gives it superb traction and gripping prowess so kids won’t be skidding off slippery surfaces. 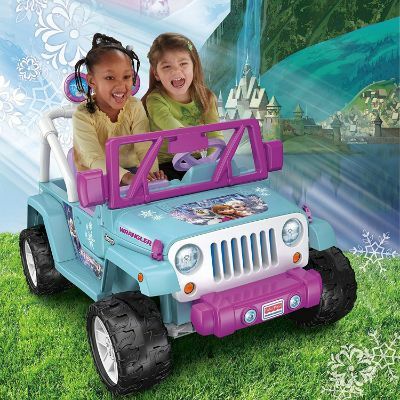 With wheels like these your child can conquer any terrain while trying to save the kingdom. 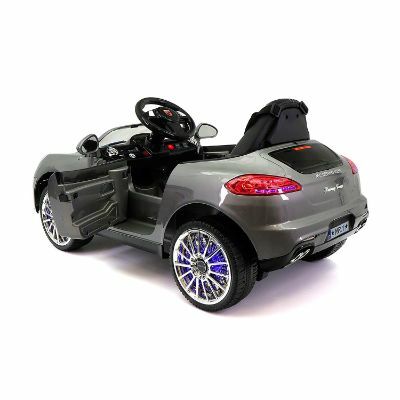 Available in six shiny colors, the Moderno Kiddie Roadster is a pretty close replica to a real car, with all the necessary safety functions to make it accessible to little ones. With a harnessed seat belt, this car is safe for kids between one and three years of age, so if you have a toddler who’s itching for their own ride-on, this is the car for you. The Parental Remote allows you to stop the car, drive it forward or reverse, pick between high and low speeds, and turn the lights on and off. A soft start and electric brake system mean no jerky, bumpy rides. It’s battery powered, by a 12V (like most ride-on cars), with two motors, and two speeds available to children. A parental remote allows adults to choose between three speeds, ranging between 2 MPH and 4 MPH. 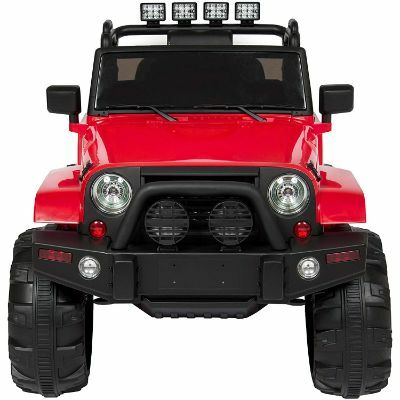 The wheels feature traction bands for tough surfaces, and an MP3 player integrated into the car allows audio input from Micro SD cards, USB Flash Drives, and external music devices like iPods, iPhones, and Androids. Kids can rock out while they roll along! Turn those sirens on and everyone pull to your right; we’ve got little tot cops patrolling the neighborhood! 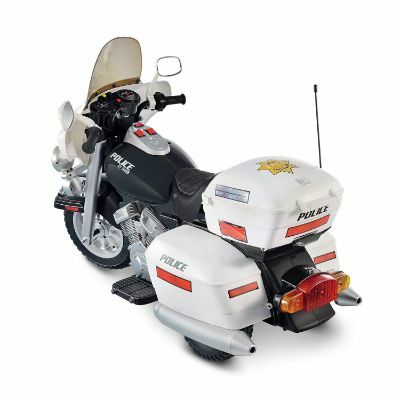 This 12V Police Motorcycle by National Products is the perfect set of wheels for little do-gooders looking to keep their street safe. Side view mirrors allow for checking the blind spots, and chrome details makes kids feel like they’ve got the real deal! It features two forward speeds of 2.5 and 5.0 MPH and one reverse speed of 2.5 MPH. It holds up to 110 total pounds and includes a storage facility in the back. The hand accelerator makes driving easy, and the ride along also features headlights, hazard lights, and signal lights. 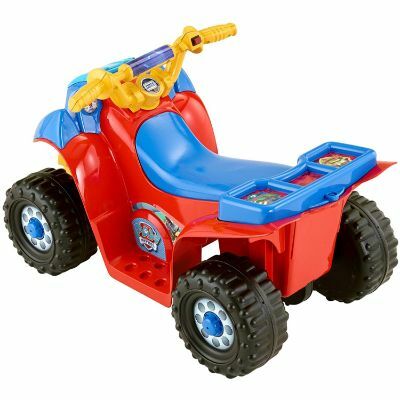 The motorcycle is fit for about fifty to sixty minutes of play after each charge, and is best suited for children ages five and up. Realistic side effects really round out the experience, so be on your best behavior, or your little police officer might write you a ticket! 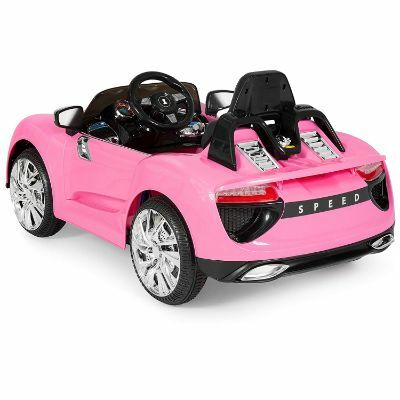 Oh so pink and pretty is this little roadster perfect for that special little toddler in your family! 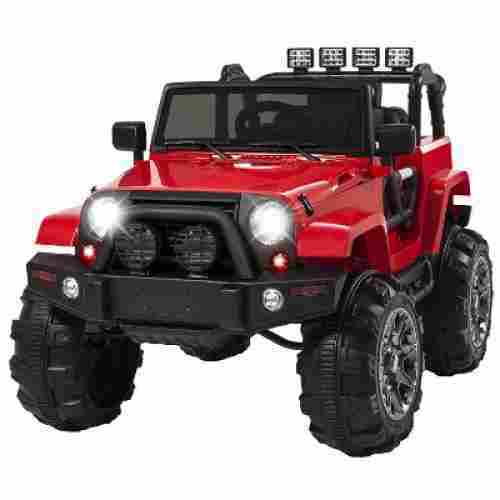 This beauty comes with a 12 volt battery that is of course rechargeable for a long life, remote control, auxiliary cord, LED lights gear switch, and easy to follow instructions for usage and assembly. Able to move at two speeds of low and high, the car can go up to two miles an hour. It can be driven on almost any surface area indoors or outdoors and is ASTM certified. The great thing about this car is that even if your child is not yet ready to handle a car on his or her own, it can be maneuvered by an adult via remote control until they are ready to take control in the driving seat themselves. 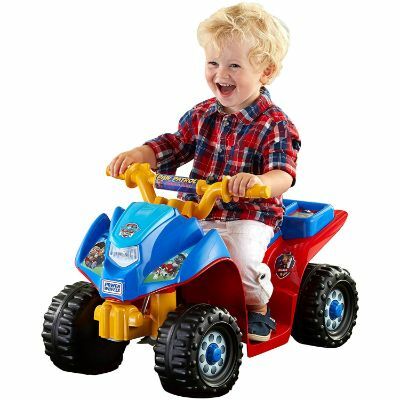 Therefore, your child will be able to grow into the driving skills needed to operate a battery-powered vehicle. It makes the perfect gift or present for the little driving enthusiast. 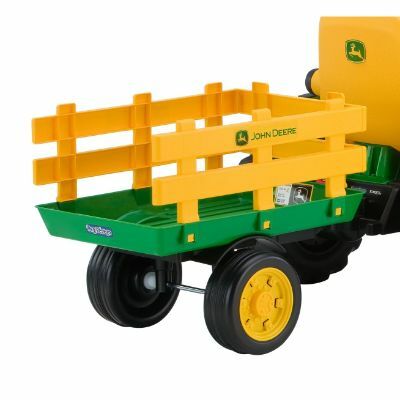 With the John Deere Ground Force Tractor with Trailer, you child can begin reliving the glory days of farming and tilling the soil. 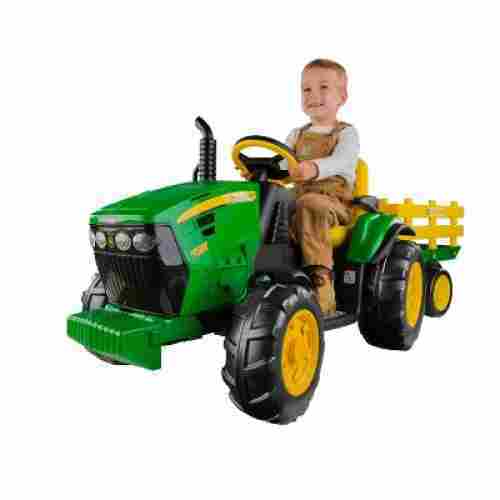 The John Deere has a maximum speed of 4.5 miles per hour and is a firm favorite in our list. For younger farmers-to be, this electric car can be set to a maximum speed of 2.25 MPH so you don’t have to worry about your younger children getting themselves into trouble. 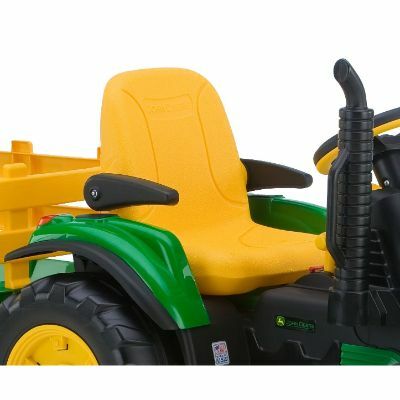 This farming electric car for kids to drive provides a very realistic experience of driving. 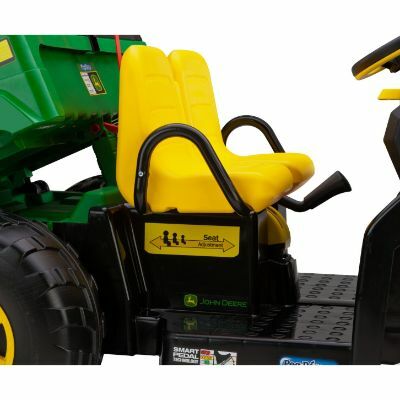 Powered by a 12-volt rechargeable battery, the tractor’s large wheels can roll over any terrain with ease whether it be on a real farm where it’s all dirt, mud, and grass or even right at the park, your very own backyard, or the beach. You kid can also take it for a spin around the neighborhood complete with a wooden stake-sided trailer. Just perfect for a single child looking to ride around in style. 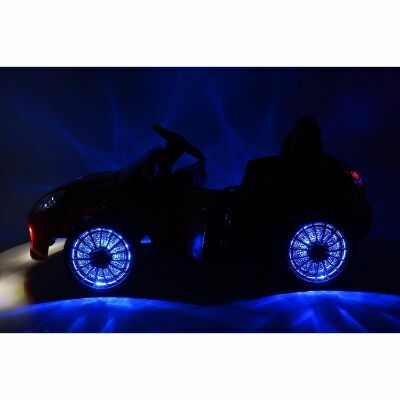 The body has been constructed from a non-toxic plastic and has a working seat belt, gear shifter, doors that magnetically close and LED lights. There are three speed options; low, medium, and high plus it even has a built-in radio. The weight capacity is 65 pounds and has a rechargeable battery that is included. Get ready to have some fun in the park or back yard with this one. This ride on car can be operated either by the driver in the car by pressing the pedal or by remote control. It is great for both experienced riders and new to the electric car game. 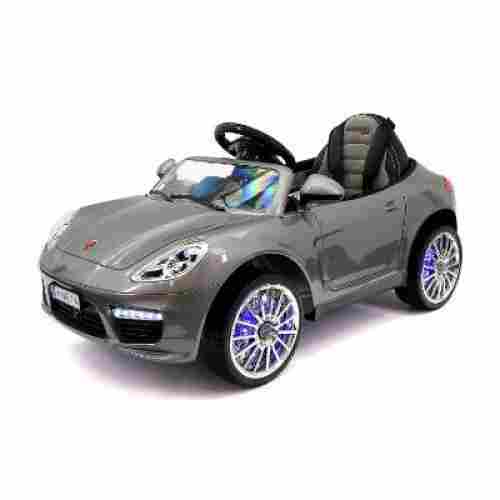 It offers a spring suspension, great traction with 14 inch wheels, and fun features on the exterior that make it look just like the real thing. The radio can play tunes from the local stations or plug in their own playlist with the AUX cable. 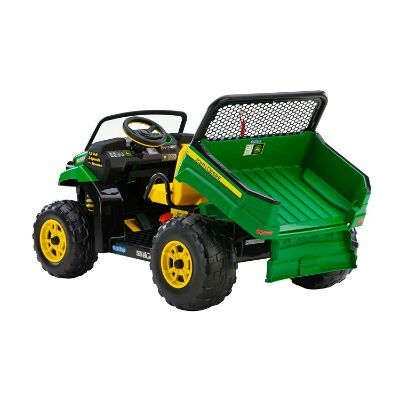 The Peg Perego John Deere Gator Xuv is a great way to bring country living right to the city. It can hold up to 130 pounds at a time, the seats are adjustable, and the car includes important safety habits: namely, the seat belt. Little ones can store their favorite water bottles or juice boxes in the included cup holder. It runs on a 12 volt rechargeable battery and includes the charger. Decked out in swanky camouflage, this car is hard to miss, and best suited for children ages three to eight. Equipped with a two-speed shifter, this little guy operates at 2.25 MPH and 4.5 MPH on grass, dirt, and hard surfaces. The second speed lockout prevents beginners from going too fast when they put the pedal to the metal. It features a dump bed with a functioning tailgate that opens and shuts easily enough for young ones to operate it. 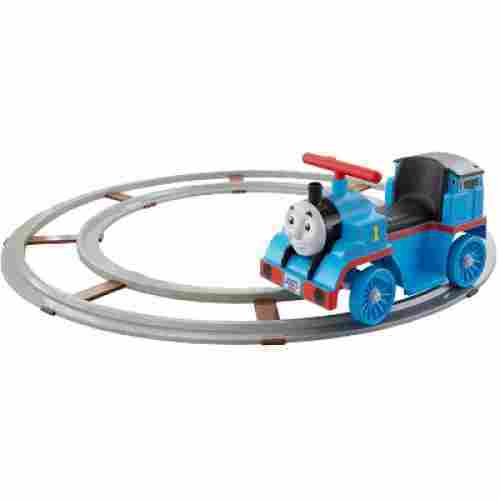 Toddlers that seem to take an interest in riding toys, especially trains, will be thrilled with this wonderfully cute Thomas Train Set that can be used on or off the included track. The track is 18 feet long that runs in a continuous circle for endless hours of riding fun. It is easy to put together and take apart for moving and storing. Operation of the vehicle is by a push button which kids learn how to use quickly. They can stop and go easily by manipulating this device. The train can go up to one mile per hour on the track and up to two miles per hour off of the track. Once toddlers learn the skills of steering their train, then they can ride off of the track and go almost anywhere they want. 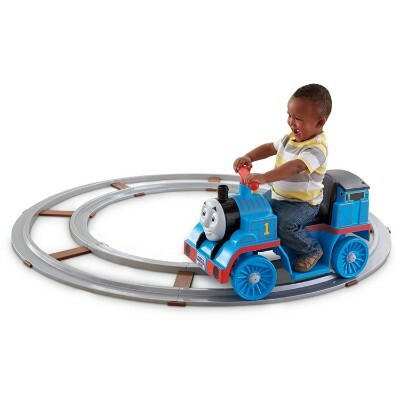 Kids as young as one year old can learn how to ride Thomas safely as they build their motor skills and balance talents on the track. The ride uses a six volt battery that is included, but for the sounds a AA battery is needed. Sounds and verbal phrases come from the little yellow whistle when it is pressed. 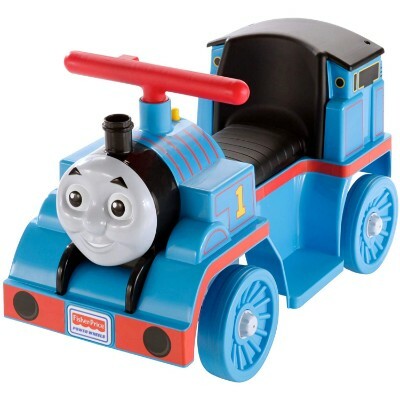 For hours of indoor driving play, Thomas the Train will entertain your toddler happily. 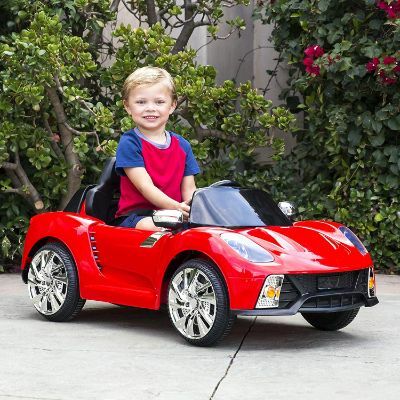 With a 12 volt battery and a charger to keep it primed, this super sports car is one fantastic vehicle for toddlers. It is made of durable plastic materials that can take the rough treatment from kids and keep on going. A wonderful safety mechanism that it does have besides the seat belt is that if kids are too young to handle the driving themselves, adults can control the car by remote. 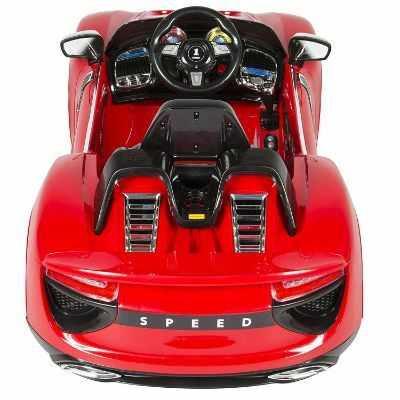 The vehicle travels up to two miles per hour so kids can enjoy some speed, but not get into any trouble or spills. 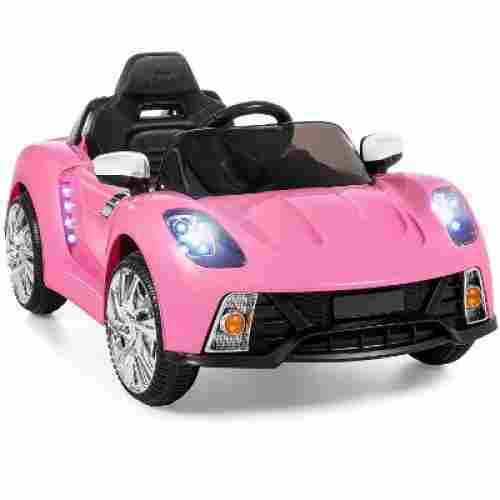 This is one great race car for boys or girls that are ready to ride! The operating features of the car are a horn, headlights, a seat belt, MP3 connection, FM radio, and steering controls. Kids can go forward or reverse, unlike some of the other models of cars that only move forwards for safety reasons. If your little one loves Paw Patrol then this is the ride on for them. On the handle bars, there is a stop and go button. This button makes it easy to go and stop when they need to. Built in to the body of the quad are footrests. This gives them a safe and comfortable ride every time. Let them control action and watch them imagine their next great adventure on this ride on the quad. There is even a storage compartment that allows them to stow away their adventure gear. With only forward motion being the only gear it is easy to drive and goes up to 2 miles per hour. It features all the cool character graphics from the show. This Lil Quad will take them on all the action packed adventures and keep them looking cool while they do it. When looking at the overall design of each car there were a couple of additional factors we took into account. >We had to consider the developmental appropriateness of the electric vehicle especially when taken in the light of the recommended age. We also had to look at safety and stability issues especially the battery charging mechanisms. When looking at the capacity of each ride on vehicle we looked at the weight limit as well as the various speeds. We wanted to include a variety of options for families with multiple children as well as options for families with one child. Paying attention to the levels of speed was important because it plays into your child's safety. In fact, we made sure to include several vehicle with parental features that allow you to control the speed at which your child drives. While the weight and speed capacity varies from vehicle to vehicle we made sure they were all appropriate for the target age range. Another factor we took into account is the authenticity of the product, as we feel the more authentic the car is the higher the entertainment value for the child. We want to remain culturally relevant, whether it is using a keyed-ignition for the design or a push-button starter, a manual or automatic stick shift. Whatever a child witnesses in their everyday life with Mom and Dad, or other adults on TV, we wanted it to reflect in our products — the look and the feel! Who wouldn’t want the authentic chrome-look of wheels on a Ford F-150 truck? Not just the look and the feel, we want the same quality and design of durability expected of a trusted auto manufacturer. 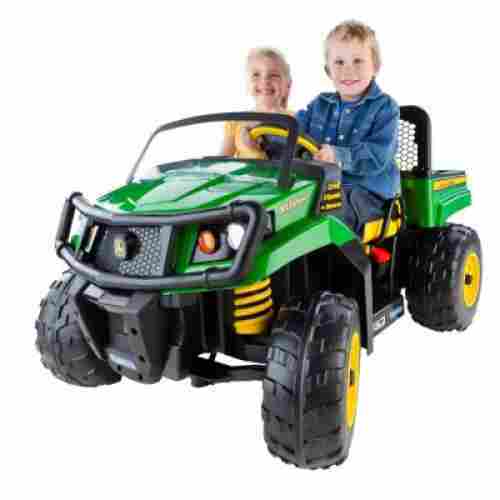 This includes the sturdy steel-frame structure of the Dune Buggy; the all-terrain tires of the John Deere model tractor; the familiar engine roar and MP3 tunes to accompany the sporty ride that's always turning heads in that direction! Motorized vehicles for kids, when used with friends, helps greatly improve social development. They learn the value of taking turns and of sharing their vehicles with other children. When friends ride along as passengers, they learn that it is a lot more enjoyable to drive and ride in the company of friends than doing it alone. This helps foster friendships and more mutually beneficial relationships. 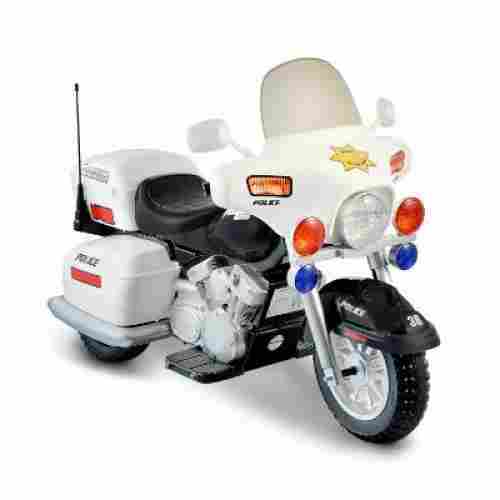 As with any electrical and mechanical toy, it is important that you are responsible and monitor your children's movements when playing with motorized vehicles. Make sure you buy reputable brands, like the products featured in this list, and always stay in a safe residential area away from busy roads and cars. Electric cars are great examples of ride-on toys that are otherwise similar with pedal-powered vehicles, except for the fact that these run on battery power. 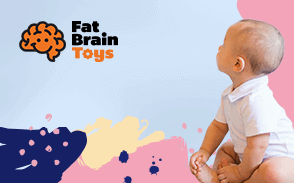 Nevertheless, these playthings are excellent for helping kids develop their psychomotor skills particularly in terms of their visual-motor coordination, balance, and proprioception. Flicking on switches also help enhance dexterity and master their control of fine motor movements. More importantly, however, is these playthings’ ability to encourage role-playing and pretend play among children. This can have a significant impact on their cognitive development especially in terms of problem-solving, spatial reasoning, and understanding of cause and effect relationships. These can lay the foundation for more complex thinking and reasoning skills such as critical thinking, creative thinking, counterfactual reasoning, and divergent thinking. For example, when given a particular terrain to navigate through, their brains are processing a lot of information to help them decide which path to take or whether to run over the obstacle or not. They are also processing the possible consequences of every action that they decide to take. Thus, these kids ride-on cars help children develop their ability to predict based on their understanding of cause and effect relationships. q: How do we gauge the authenticity of the product design? In some ways, the specs speak for themselves. Savvy parents can see thorough research and dialogue our company made with car manufacturers to mirror the authentic driving experience to meet their child’s needs. q: Is the maximum weight restriction/capacity enough? On average, our products have a maximum weight capacity of 130 lbs. This is taken from the usual height-weight ratio of a child below the age of 12. Depending on the specified product, at most, it can comfortably seat two. q: What is the point of equipping these cars with “real life” radio or engine sounds? It is proven that our auditory functions and familiar with the world begin in-utero. From an incredibly early age, we begin to make sense of our environment through auditory senses. This helps to reinforce socio-cognitive function, as well as begin the early development of hand-eye coordination - it truly is a skill to rock-out to a tune while steering a vehicle! q: Why a maximum speed of only 7 mph? This is the speed that a parent would probably feel most comfortable without endangering their child. Anything higher, would not be recommended for toddlers or preschoolers. q: What can I do to get additional battery-life? We understand that your child can be like the Energizer Bunny when it comes to playing! We recommend limiting use of the battery car in order to conserve the life of the battery. Then, to recharge the battery after nearly every use before it runs out. It’s just like filling up your gas tank every time before it runs on “E”. q: What is the possible resale value once my child outgrows this toy? While this is a valid question, there is no easy answer! What can be said, is that these are definitely “legacy-pieces”, whose value will only increase with time.